An EMP can be caused by the detonation of a large bomb, nuclear or otherwise, in the atmosphere, miles above land. [Actually, an area the size of the US could be crippled by a small nuclear device detonated at the edge of space over the target region. Mr. Larry] Its pulse wave can easily cover a continent and destroy electronic components in computers, engines, power plants, and solar panels alike. An event like this has never happened on a large scale, and there are differing opinions as to the exact consequences, but one thing is certain: In a matter of moments, life as we know it would be gone forever. Our closest star, the sun, could also do extensive damage in the form of a Coronal Mass Ejection (CME). The results would be similar. We rely on electronics way too much to ignore the potential of these events, and although even the experts aren’t always in agreement where details are concerned, it makes sense to have a plan to protect important electronics in either event.What experts do agree on is that many items with any type of electronic component may become inoperable by either a CME or EMP. From Survival Mom: “How to prepare your family for everyday disasters and worst-case scenarios”: I don’t have a plan to turn my garage into a giant Faraday cage in hopes that our vehicles would be spared, but I have made plans to protect other, smaller items that would make a huge difference in our survival following a CME or EMP. Here is a list of some of those items. B. What To Store In Your Faraday cages? Here is a list of suggested items that you may want to consider placing into a Faraday cage or Faraday Protection Unit (FPU) to protect them from the destructive effects of EMP. Note: There is a two-part podcast series that explains all of this in great detail. Be sure to listen to it by starting with the first part of EMP and EMP Protection. First, the items I list below might not be affected by an EMP if unprotected, but why take the chance? If there’s an electronic item that you deem important for your survival, then you should have it protected. Second, you need to get your head wrapped around what life will be like without power and concentrate on storing those things that will give you a tactical and strategic advantage. Things like radios, for both personal communications and gathering information. For example, CB, FRS, GMRS, Ham and short-wave radios. The gear to do digital communications, like Digital HF, would be good, too. A short-wave radio is important to hear broadcasts from other countries that weren’t affected by the EMP, as it may be a long time before there are any local news sources broadcasting. Flashlights – What? you didn’t know that modern flashlights have electronics in them? If you have an LED flashlight, chances are that is has circuitry in it. Not to mention, the LEDs themselves are very sensitive to EMP. The old type of flashlights which are basically a battery-switch-incandescent bulb aren’t at risk. Power generation equipment: generator parts, inverters, charge controllers, battery chargers, etc. It’s currently thought that solar panels would survive an EMP because there isn’t micro-circuitry in them. However, if they are small, wrap them in foil and nest them inside a steel garbage can. 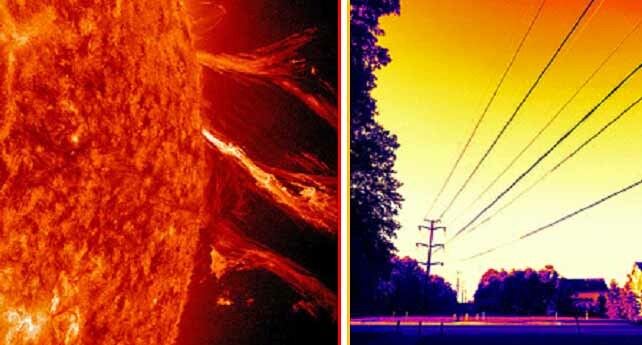 UPDATE September 1, 2012: I may have muddled this and want to clarify: we do not know for certain whether solar panels will survive an EMP, thus you should protect them like any other electronic device if your post-EMP plan relies on them. Repair parts for cars, trucks, tractors, ATVs, etc. Night vision and other electronic optics. Computers (preferably laptops and tablets), PDAs, smartphones, ebook readers (Kindles, Nooks, etc.). If you have old stuff laying around, might as well as try to protect it. Don’t underestimate the force multiplier of having these things. Most of the tablet stuff (smart phones, iPads, Kindles and other ebook readers) are pretty rugged and will most likely last a long time. Imagine having the power of massive amounts of stored information at your fingertips. Don’t forget to load these up with your survival info, documents and PDFs! In addition to reference material, you should also put a lot of novels on these. Without TV or radio, reading will be a huge pastime. Use USB thumb drives to store backups of your reference materials, books and photos. These are very rugged and are very easy to wrap in foil to protect. Make sure that the small devices you have can be updated from the computers you have. This is important in case they lose their info or you want to change the info. On a similar note, WiFi components like wireless routers allow people to stay connected with these devices. This wouldn’t be at the top of my list of things to store, but if I had extra stuff laying around, why not protect it? It only costs a little foil and some space. Ink-jet printer. Hey, why not. Printing information could be very important when the lights go out forever. Choose a printer that uses very common ink cartridges. Though you can store some of these cartridges, you should be able to find these readily, as no one is going to be needing them. Many of these devices have internal batteries that need to be recharged fairly often. You’ll need to account for that and set up a schedule that allows for you to pull these out and recharge them on a regular basis. One simple solution would be to export all of your preparedness and survival information as PDFs and store them on several USB flash drives. An old, used PC laptop should be able to read these just fine. Solar battery chargers – these are those complete kits with the charger and solar panel integrated. Medical devices – if you have any electronic medical equipment, either for rendering aid or because you need it to live (blood testers, O2 machines, etc. ), make sure to have spares. Cordless tools – drills, saws, Dremel tools. Calculators – solar calculators would be best, as they don’t need batteries. Batteries – Although small batteries weren’t affected in the 1962 tests and car batteries seem to survive EMP testing, why take the chance? Put some in your FPU. Energizer makes lithium batteries that have a long storage life. Energizer Advanced Lithium will store 10 years, and Energizer Ultimate Lithium will store 15 years. Even regular Alkaline batteries should have a shelf life of 5 – 7 years. You can even store rechargeable batteries, though you should probably run them through a charge-discharge-charge cycle at least once per year. SPEAKING OF BATTERIES – Make sure to remove the batteries from all gear before storage. There would be few feelings worse than opening your cache of EMP-proofed gear, only to find that the batteries that you forgot to take out had leaked and destroyed the equipment. CFL or Compact Fluorescent Lights – If your home or retreat has its own power source and you plan on using CFL lights because of their efficiency, know that they have electronics in them to control the voltage to the tube. When not connected to a light socket, they’re probably not susceptible to EMP, but if your power plan requires these, then stick a bunch in a steel garbage can to be sure. A Throw-Away set of equipment. Open this first to check on radio signals. Include some ear buds and batteries. Keep this in a separate Faraday protection unit, away from your main stuff. Of course, this is also good for other things that need power, too. Have analogue backups for everything. GPS units are nice, but even if they worked after an EMP attack, the satellites will rapidly drift off course without constant correction from ground control. Maps; compass; manual can opener; writing stuff like paper, pens, pencils; whistles instead of radios; candles and kerosene lanterns instead of battery operated and LED ones. Multimeters, circuit testers, repair equipment. Audio or music players, like MP3 players or iPods/iPhones, including any active speakers (speakers that have their own amplifiers). Radiation meters – actually, these should be EMP proof already, but again, why take the chance? At the very least, wrap them up in foil while they’re in storage. Digital camera. Not really a high-priority, but could come in handy if you had a computer and were doing some recon. 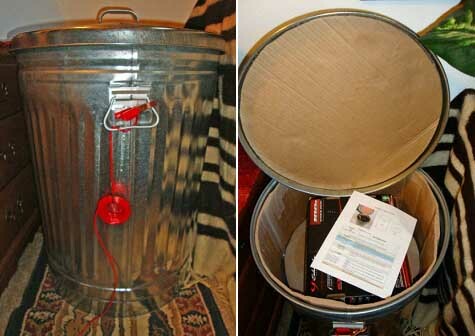 Clocks – if you have old digital watches and clocks, why not put them in your Faraday cage? It would be better if you had a set of mechanical, wind up clocks and watches, but if you have the room, include the digital ones. DVD players. If you have a lot of movies on DVD, might as well have a way to play them. But, you’ll also need something to play them on, like a small monitor, so you’ll need to store this, too. This list is not prioritized, but you should prioritize your list before you start, as not everything on this list is necessary for survival. Those critical items, like medical devices needed to sustain life, power generation, flashlights, batteries and communication gear, would have the highest priority and should be protected first. Anything else that would give you an edge, like computers, night vision, powered scopes, perimeter monitoring, and items that make it possible to repair other items, should be the next highest on the list to protect. Other things like DVD players, cameras, and handheld games should be the lowest priority. They’re nice to have, but not critical to your survival. That isn’t to say that you can’t have them, just concentrate on the needed items first. Just in case you run out of foil. One note about storing electronics for use after an HEMP or CME event. Keep in mind that without the infrastructure to make replacement parts and devices, what you have may be all you have. Ever. All the digital information that you have is to help you start a new life and give you an edge on learning all the new skills you’re going to need, now that there is no more electrical grid. Don’t plan on being able to access the information in digital format forever, or even for very long. If you don’t have paper backups of everything in your computers (and you should), then your post-HEMP/CME plan needs to include a way to start printing out all that info. Paper might be archaic in this digital age, but you can still read it after the power goes out. If you are not living on your retreat property when it happens, you should have a plan that calls for you to bug out to it immediately. It will probably take 1, 2 maybe 3 days for people to realize how bad it’s going to be – use this time to get to the location that you plan on staying in. Since we don’t know what vehicles will survive an EMP, you’ll need a plan for acquiring one that still runs, but you can store the fuel you’ll need to get there now. And, just to be clear, you need to have stocked up on everything. Because not only won’t there be anything made for long time, but once people realize how bad it is, it will likely become a dog eat dog world. To me, one of the best ways to get ready for this is to become part of a community, preferably one that can grow food and has access to clean water and natural resources, like trees. It’s been said that an EMP attack would be like time-traveling the entire country back to the mid-1800s. But it will be worse than that. In the mid-1800s, we had people that knew how to grow food and make things by hand. We will have to re-learn those skills.